“You didn’t know what was happening. You didn’t start it. He knew it was wrong. You didn’t know any better. Please remember this. This is a letter written by someone who survived sexual violence as a child. 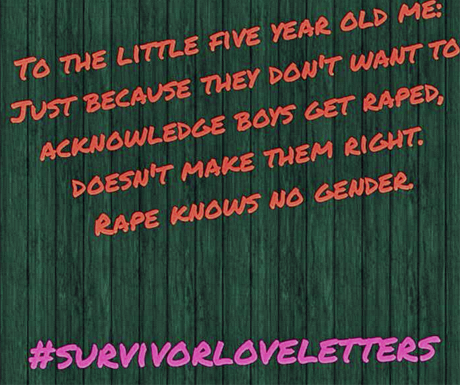 It’s part of a series of letters where abuse survivors write love letters to themselves, called #survivorloveletter. The movement and its Tumblr blog was set up by activists Tani Ikeda and Suey Park on Valentine’s Day. “For many of us, Valentine’s Day is an anniversary of violence,” reads a message on the website. “#survivorloveletter is a call to survivors of sexual violence and our loved ones to publicly celebrate our lives. “By telling our stories we seek to build knowledge and reflect on the ways we heal ourselves and our communities. Dozens of people have since submitted letters to the blog, many of them writing to their younger selves who survived child abuse. 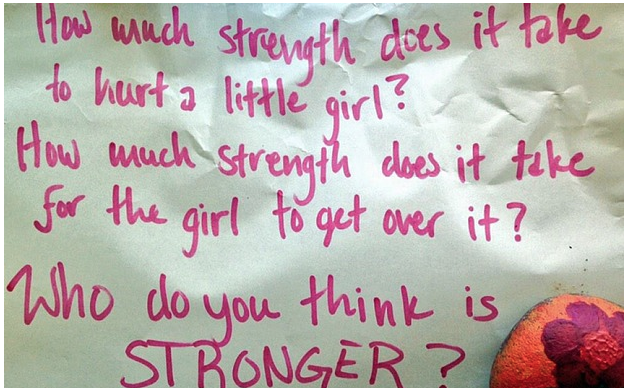 “How much strength does it take to hurt a little girl? How much strength does it take for the girl to get over it? Who do you think is STRONGER?” writes one woman. Though the movement began on Valentine’s Day it has continued in earnest, with people on Twitter writing messages such as “you are more than your experiences of abuse” and “I will be my own heroine”. Others have said the letters have inspired them.